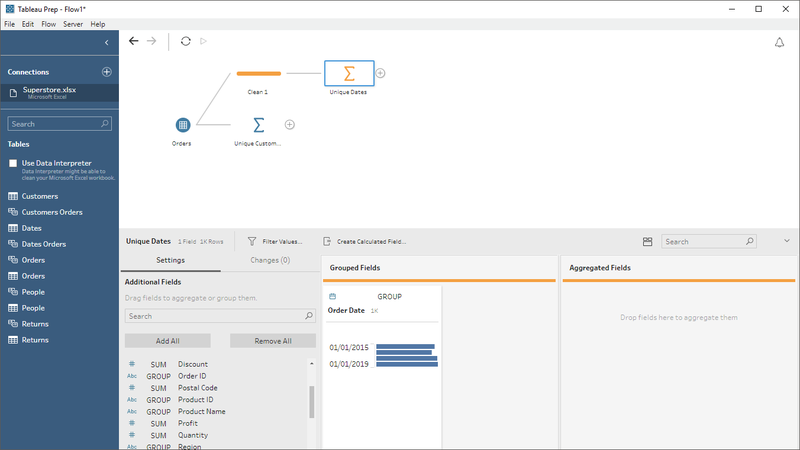 I spend a lot of time answering questions on the Tableau Community Forum and one common problem I see is missing dates. For instance, you may want your visualization to always show all twelve months of the year, regardless of whether or not there is data for all twelve months. Quite often, the solution to these problems is to use a date scaffold. 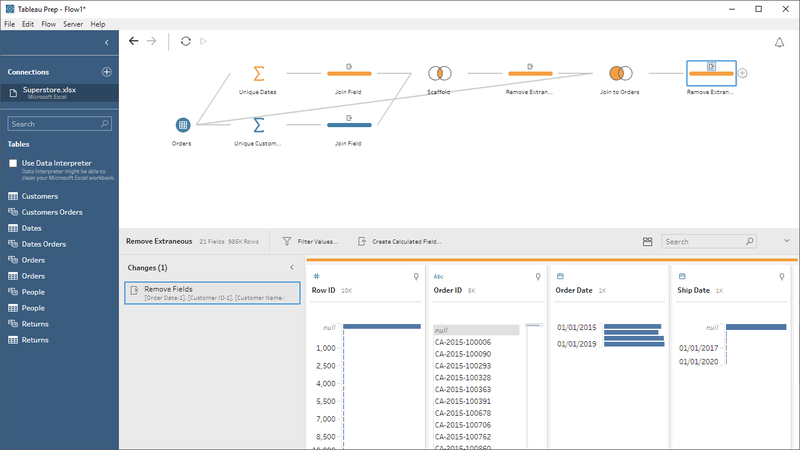 So, in this blog I’m going to show you how to create and use a date scaffold in Tableau. 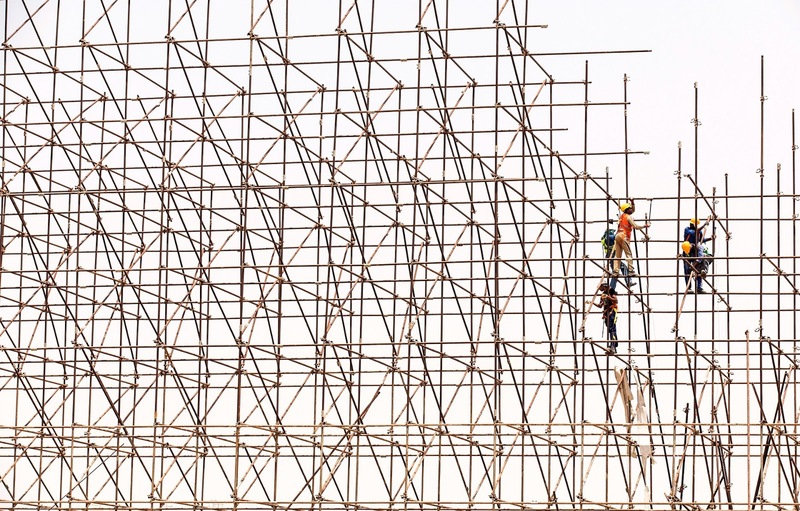 I will note here that I’m not the first to write about data scaffolds—it’s actually a pretty common technique and something that has been written about quite a bit. But my goal is to give you my spin on it as well as provide a couple of different methods for creating a scaffold. Before we jump into the tutorial, let’s define the term “Data Scaffold.” Dictionary.com defines “scaffold” as “a temporary structure for holding workers and materials during the erection, repair, or decoration of a building.” So a data scaffold is kind of the same thing—it’s a temporary (or artificial) structure used to arrange the data in a certain way to aid in the creation of a data visualization. This technique, which was pioneered by Joe Mako—former Tableau Zen Master and one of the most brilliant Tableau people ever—is incredibly powerful and versatile. 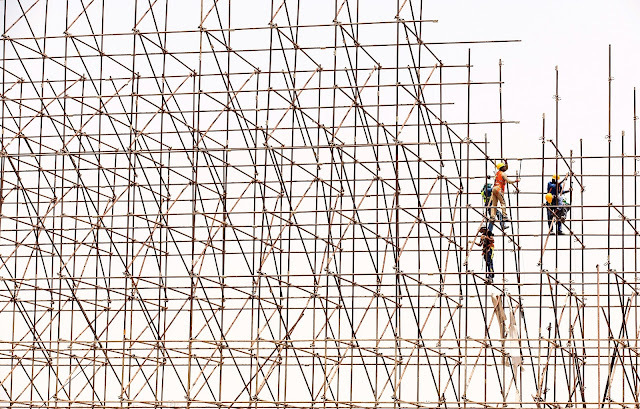 So, let’s take a look at a use case for scaffolding. We’ll start with this fairly simple highlight table which uses the Superstore data set and shows Profit Ratio by Month for each Customer. We can now see a couple of problems. First, because none of these customers have sales for February, March, and July, those months do not show at all. Second, because Aaron Bergman has no sales at all for this year, he is not listed. In some cases, this may be exactly what you want, but in many circumstances, you’ll want to show all of the months and all of the customers. This is where we’ll leverage a data scaffold. 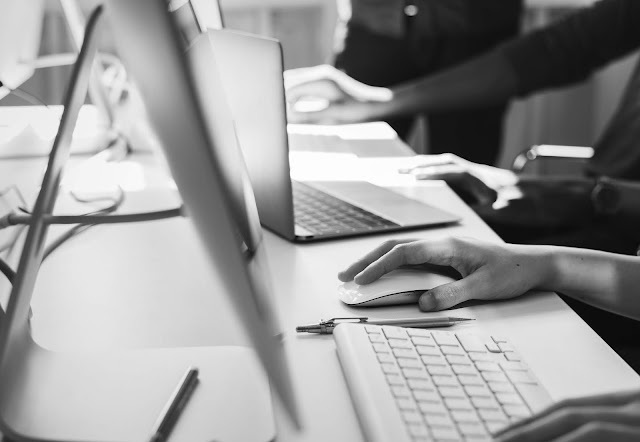 What we need here is to ensure that every customer has data for every date, so even if you filter down to just a single customer, you’re guaranteed to always show every month. But how do we do this in Tableau? I’ll show you how to do it in both Tableau Desktop and Tableau Prep. Next, rename the tab “Customers” and delete all columns except Customer ID and Customer Name. Finally, select both of the columns, then go to the Data menu and click the handy “Remove Duplicates” button. This will leave you with a list of the unique customers. Next create a new tab and call it Dates. We’ll use this to create a list of all dates we wish to use in our scaffold. Since the Superstore data set has orders for 2015 – 2018, we’ll create dates from January 1, 2015 through December 31, 2018. 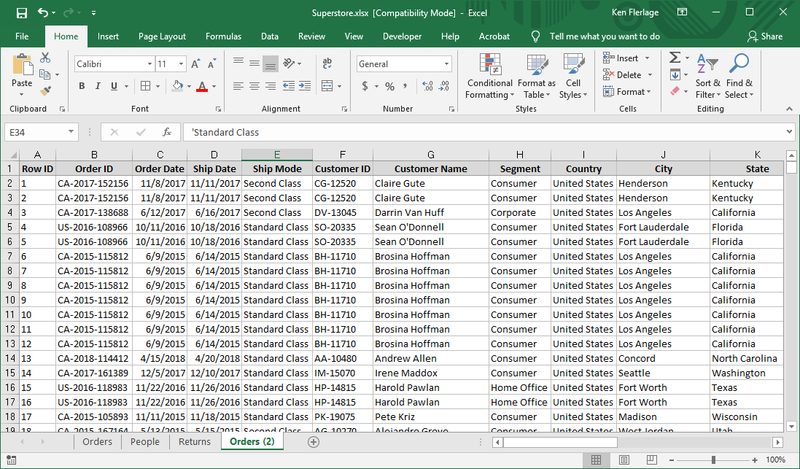 Start out by creating a header row with a name for the column (“Date”) then fill in the first two rows with 01/01/2015 and 01/02/2015. Now select these two cells, then grab the bottom right-hand corner and start dragging down. 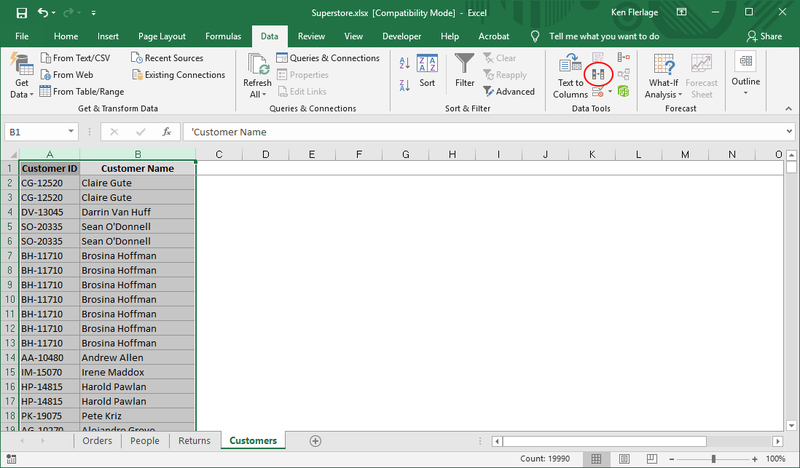 Excel is smart enough to realize that you want to add one day to each subsequent date. So keep dragging until you reach December 31, 2018. Okay, now let’s connect to this spreadsheet in Tableau. Remember that our first goal is to create a list of each customer with each date. To do that, we’ll need to use a cross-join. A cross-join matches every record from one table with every record from a second table. 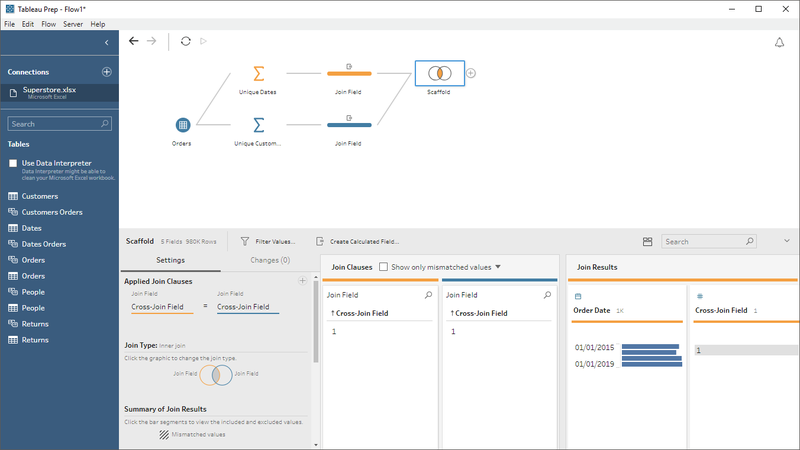 Tableau doesn’t have cross-joins out of the box, so we can use join calculations to mimic a cross-join. 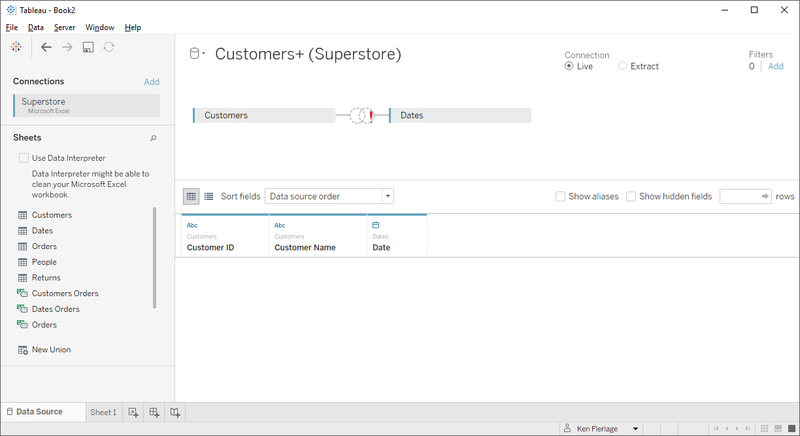 Start out by dragging Customers and Dates to the data pane. 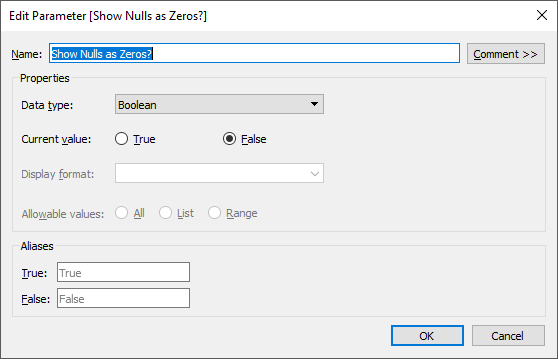 In the calculation editor, simply type the number 1. Then do the same on the right side of the join. This is kind of like artificially creating a field in both tables and making all the values 1. Then, when you join on these, since all the records have the same values, every record in the left table will join to every record in the right table, which is, of course, exactly what we want (for more on cross-joins and database joins in general, see SQL for Tableau Part 2: Combining Data). Next, we want to left outer-join this data back to the Orders table. By left-joining, we’ll get every record from our scaffold plus any matching records from Orders. 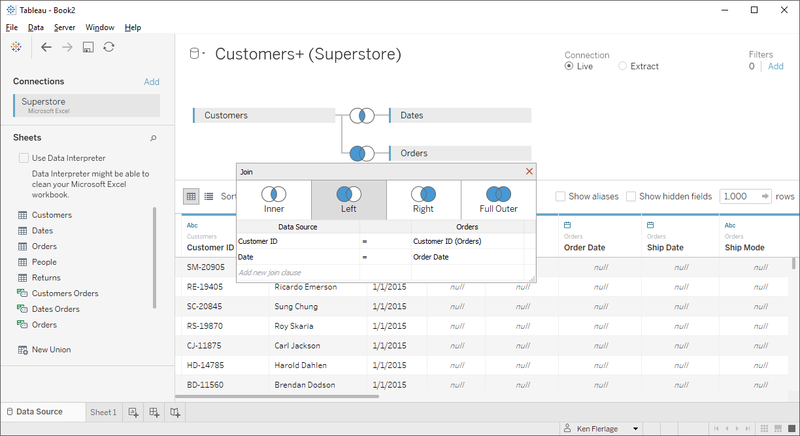 To do this, drag the Orders table over to the data pane. Then set up a left join where Customer ID = Customer ID and Date = Order Date (Note: the Customer ID on the left side actually comes from the Customers table, while the Date on the left side comes from the Dates table). And that’s it for the data modeling. Next, jump over to Tableau and create a new highlight table exactly like the one I showed earlier. Notice that Aaron Bergman shows on the chart, despite not having any sales. This can be a very important insight because it’s an opportunity to sell to Aaron. If he weren’t visible, we’d probably miss this. Also notice that February, March, and July all show up in our chart, despite there not being any sales. // ...then perform the conversion. 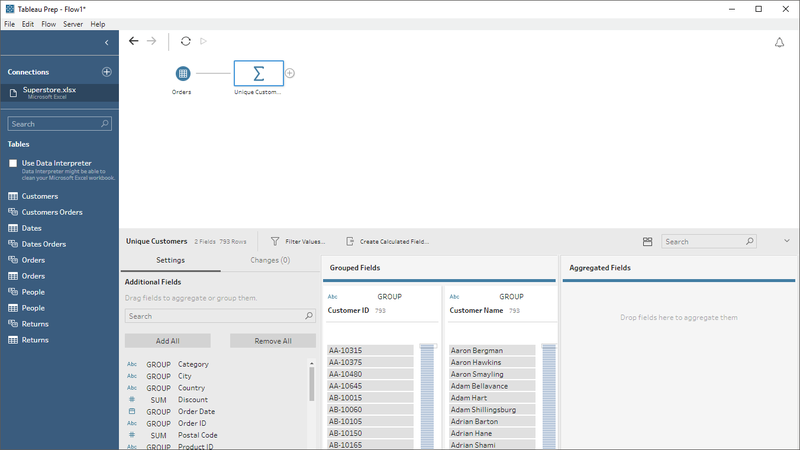 Alright, we’ve done this in Desktop, so now lets take a look at how we can do this in Tableau Prep. In some ways, this is actually a bit easier as it won’t require us to perform any manual manipulation in Excel. Start out by connecting to the data and dragging over Orders. Now, just like in Desktop, we want to create a unique list of customers and a list of dates. Let’s start with customers. 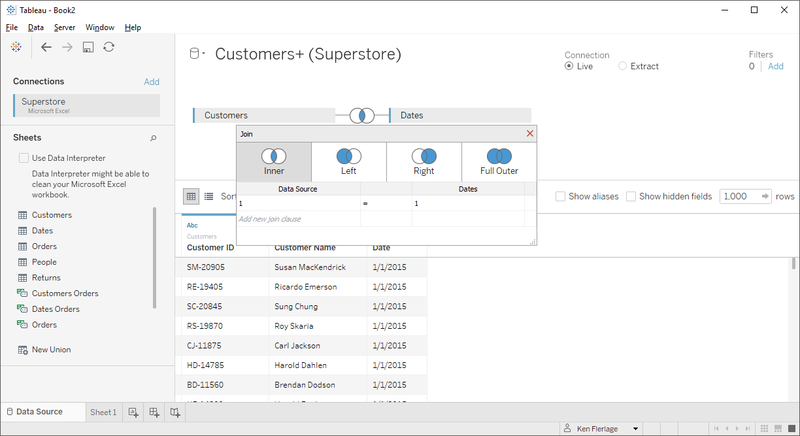 Create a new aggregate step and drag Customer ID and Customer Name to the Grouped Fields. You won’t need any Aggregate Fields. This simple step will result in a unique list of customers. Now let’s create our list of dates. Since we know our Orders table contains a comprehensive enough list of dates, we don’t actually have to create a list of every possible date like we did earlier—instead, we can use the unique list of dates from the Orders table and that should be good enough. So, create a new branch then create a new aggregate. Drag Order Date to the Grouped Fields. Note: When you create a new branch, Tableau Prep automatically inserts a clean step (Clean1 from above). As we’re not using that, you can delete it after creating your aggregate step. We now have our list of customers and dates, so we’ll need to cross join them together. Tableau Prep doesn’t allow join calculations, so I’m going to first create a clean step after each of the aggregates which will create a new field called Cross-Join Field with the value of 1. Now we’ll create a new join step and connect both of our branches as inputs to the join. We’ll then set up it up to join on the Cross-Join Fields. Again, since both are 1, this will match every customer in the customers list to every date in the dates list. As we no longer need the Cross-Join Fields, I’ll create a clean step and remove them. Our next step will be to left join this back to our original Orders table, so create a new join step then drag the Orders object (all the way on the left) to act as a source to the join. 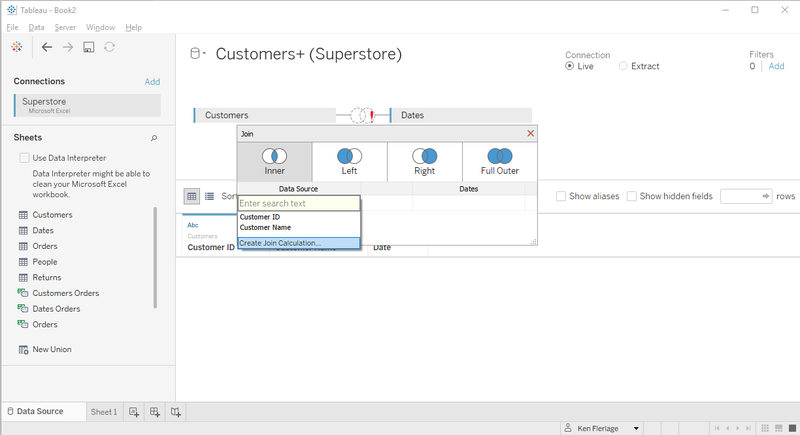 Set up the join clause to perform a left join on Customer ID = Customer ID and Order Date = Order Date. Since we’ll be using the Customer ID, Customer Name, and Order Date fields from the scaffold, we don’t need these fields from the Orders table, so I’ll create a clean step to remove them. Finally, we can just add an output step. I’ll set it up to write to hyper. The next step, of course, would be to bring this data source into Tableau and create our highlight table. As we’ve already done that, I won’t go through that process again, but I’ll just note that we’ll get the same exact results as the scaffold we created in Desktop. While dates are one of the most common use cases for data scaffolds, there are lots of other interesting and creative use cases. Now that you understand the basic concept, hopefully you’ll be able to use it to address lots of different business challenges! I’ve uploaded my final workbook to Tableau Public. It includes the highlight tables with no scaffold, with the Desktop scaffold, and with the Prep scaffold. I’ve also made my modified Superstore spreadsheet and my Tableau Prep workflow publicly available. You can find them both here. Thanks for reading! If you have any questions, feel free to leave them in the comments section below or reach out to me directly. Awesome article! Very clear logic and clear description. This skill could be widely used in real project to resolve missing dates and IDs problem. Thanks, Ken!